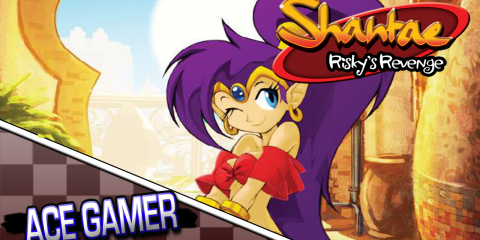 Welcome to another edition of Free To Play, where I examine political topics in gaming from a libertarian viewpoint. Currently, libertarianism is a small portion of the voting population, but our ideas are gaining recognition in the national consciousness. Between South Park, Ron Paul, and Ron Swanson, people are beginning to understand what being libertarian actually means. This also includes those who disagree with our beliefs, but choose to make intelligent villains based upon the ideology, not just strawmen – essentially fictional effigies that intentionally misrepresent the arguments of opponents to make them look bad in the eyes of those uninformed. As what seems to be par for the course in Free To Play, there are spoilers ahead. You’ve been warned. The perfect example in gaming is Andrew Ryan, creator of Rapture, the city under the sea, in Bioshock. 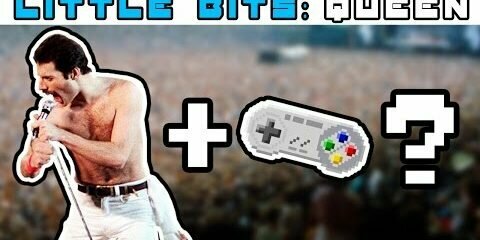 I’m fairly certain that the majority of gamers are well aware that Ryan was designed as a deliberate expy of Ayn Rand (Since I use the word often in this article, an expy is short for “exported character;” a character from one work that is very clearly based upon an existing character from a different work), right down to their very initials being the same. I would counter that Ryan is not only an expy, of Rand herself, but also of her most famous character John Galt. Before I get into why Ryan represents Galt, let’s cover the basics of both Ryan’s philosophy and Rand’s own school, which she titled Objectivism. In the interest of full disclosure, I am not an Objectivist and I have never been able to slog through more than the Cliff’s Note version of Atlas Shrugged, but I have read quite a bit of Rand’s nonfiction work. Let’s look at what Objectivism entails. Wait, are Objectivists against religious stuff? Objectivism aims to be a complete philosophy in that it covers nearly all aspects of humanity. It deals with ethics, politics, metaphysics, and even aesthetics. To cover the entirety of Objectivist thought in one simple article is beyond the scope of FTP, and I recommend the Wikipedia article on the subject wholeheartedly, but I will attempt to give a good basis of Objectivist philosophy. Rand based her philosophy on both classical liberalism, or what we know as libertarianism, and the idea of an “objective existence.” She believed strongly in the rights of the individual, which meant strict adherence to property rights and opposition to any political thought that in any way infringed upon individual rights by giving more power to the collective. Objectivism and libertarianism are allied in this regard, and for the most part Rand’s political thoughts were definitely within the realm of libertarianism, although she was strongly against being called libertarian. This is not the best time to shrug! Rand once described libertarianism as her philosophy “with its teeth pulled out.” Rand was a vocal supporter of free market capitalism and often decried anti-communist crusaders such as the John Birch Society of not being capitalist, but merely anti-communist. Rand often called herself a “radical for capitalism.” Objectivism advocates a very limited government; far more limited than even modern Republicans would ever support. Rand, however, was not anarchist, as she believed the government had to exist for one legitimate function: preservation of rights. One of the things that I do like about Rand’s philosophy is that she builds every belief of the system upon basic statements of logic, which gives the philosophy a strong framework upon which to evaluate the world. Objectivism goes beyond politics, as it also encompasses religious thought as well. In fact, one of the main arguments that many have with Rand is her uncompromising atheism. Okay, I like this quote too. Beyond the atheism, what most who criticize Rand have against her is that she was an unflinching egoist in the most intellectual manner. A perfect statement of this egoism, or belief in putting your wants and needs above others, is her character John Galt’s immortal quote, “I swear by my life and my love of it that I will never live for the sake of another man, nor ask another man to live for mine.” Rand went so far as to call this belief “rational selfishness.” Obviously, this is a stark contrast to the majority of moral philosophies that place great respect and value upon sacrificing oneself for others, and often further into the individual being secondary to the collective. Rand considered “primitive beliefs” to be her enemies, and the two beliefs at the top of her list were superstition and collectivism. I’m going to ignore metaphysics for the most part because all you need to know about Rand’s metaphysics is that she was a strict materialist who thought any form of religion was an insult to human reason. The idea of a collective being more important than an individual was anathema to Rand, and her quote on minority rights is probably my favorite thing she ever wrote: “The smallest minority on earth is the individual. 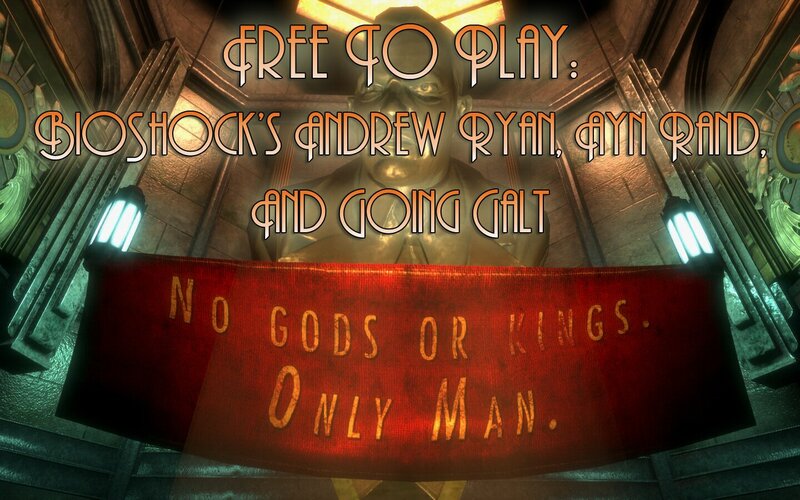 Those who deny individual rights cannot claim to be defenders of minorities.” The fact that she so supported capitalism, property rights, and a non-intrusive government leads perfectly into Bioshock’s Andrew Ryan. Andrew Ryan is an interesting character beyond the fact that he’s incredibly well-written and performed. He’s interesting because he’s a character designed to attack a certain viewpoint, yet he is not a strawman. It’s an incredibly rare thing that a character is written with a perspective opposite of the writers, especially one designed to be villainous because of those beliefs, yet not written as a mindless stereotype of libertarianism. Ken Levine and his team really proved their mettle with Bioshock, and proved it time and again. I’m entirely certain there have been dozens of articles on the Internet that detail how Ryan is a mirror of Ayn Rand, and how he represents/misrepresents her philosophy. The basis of this article is that Ryan is not in fact a mirror of Rand, but an expy of Rand’s greatest character, John Galt. That’s what I’m getting to. Galt is the protagonist of Rand’s magnum opus, Atlas Shrugged, and is used in more political slogans than you can shake a stick at. He is an engineer by trade who invents an engine that runs on just static electricity in the environment. Unfortunately, the company he works for decides to live by the collectivist ideology that everyone gets the same, so he is not rewarded at all for his efforts. He leaves the company in disgust while secretly fomenting a strike of the world’s makers: artists, inventors, engineers, businessmen, and others upon whom modern society depended upon. He formed his own haven, Galt’s Gulch, according to his beliefs while encouraging like-minded people to take up residence. The Gulch was created to be a utopia of their own making, where the creative forces of the global economy could escape to work unimpeded by an intervening state. In this place they could work on their own projects instead of being forced into mediocrity by collectivist mechanisms. As the world economy grinds to a halt due to its main innovative minds disappearing, the governments of the world seek answers. Among the people, the question, “Who is John Galt?” is thrown about as the governments grow increasingly despotic in their desperation. The main characters of the book, Dagny Taggart and Hank Reardon, eventually discover Galt’s Gulch along with Galt’s strike of the minds. Taggart can’t stand to leave behind her family’s railroad company so she soon returns to New York City along with John Galt. Galt hacks into a nationwide radio broadcast to deliver one of the longest monologues I have ever seen just to beat you over the head with the themes of the book. As the government falls, Galt is captured but rescued before he is tortured. He ends the story by stating that they will rebuild society. Does that sound familiar yet? 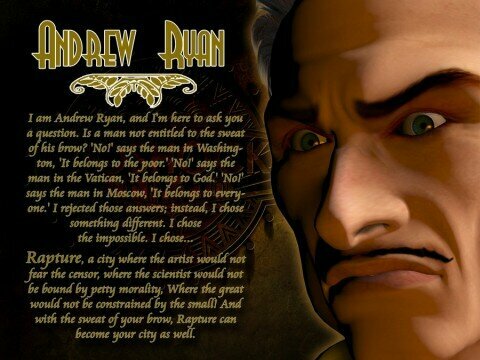 If not, then you likely are unfamiliar with Bioshock’s Andrew Ryan. Let’s do a quick rundown. Andrew Ryan is a wealthy industrialist who becomes disillusioned with the rest of the world. He sees it full of those who would take the creations of others simply because they can. These “parasites,” in Ryan’s terminology, start with both the Bolsheviks and the Communists in his home country of Russia. Fleeing the Russian Revolution, he makes his home in America and initially deeply loves his adopted home. However, the parasites soon catch up to him as he feels intense disgust toward the policies of Franklin Delano Roosevelt, going so far as to call FDR’s vision a “Bolshevik prison.” Things come to a head in destructive form as the forest that Ryan owns for a personal retreat gets claimed by various groups, including the US government, but Ryan decides to stop the parasites in the most effective way possible. Instead of anyone getting to decide what to do with Ryan’s property, he burns the entire forest down. Now, you may not agree with any of his politics or even mine, but you have to admit that burning down the forest to spite assholes who want to take his own property earns him some major badass points. I love this monologue, although Ryan looks like he smelled a fart and doesn’t know who to blame. The final straw for Andrew Ryan is the bombing of Hiroshima. A devoted materialist, Ryan believes that science is a light in the darkness for mankind, yet in Hiroshima he sees a guiding light turned into a destroying force. He decides that this weapon is the ultimate plan of the parasites, for with it they can take anything from the producers that they see fit with little recourse. Ryan decides that the best way to escape the clutches of the various parasites is to found a utopia where they can’t touch him or other like-minded people. By the use of various shell companies funded solely by his own deep pockets, Ryan amasses the technology and supplies to build a city on the floor of the ocean, far away from the greedy fingers of the parasites. He invites other innovators to join his underwater paradise far from the prying eyes of the over-reaching government. Then comes the shocker: this capitalist paradise, Rapture, written by those who disagree with its tenets, thrives. For over a decade, Rapture is a stable beacon of economic progress and scientific advancements, until they discovered ADAM. ADAM is a unique substance derived from a type of sea slug that forms stem cells in the human body, allowing it to do things that would otherwise be impossible. Repeated use of ADAM, however, not only allows for amazing powers, it makes the user completely insane. Ryan refused to make any laws that regulate its use, and this is what led to the fall of Rapture. Ironically, Ryan created his most powerful enemy with his only law that was, in fact, a regulation on free association. Ryan refused to allow any communication with the outside world except those that he approved, which led to a black market in smuggling. Enter Frank Fontaine, a grifter who managed to lie, cheat, steal, and murder his way into Rapture. Ryan’s views allowed Fontaine to build a substantial power base which he used to start a revolution under the guise of Atlas. The civil war between Ryan and Atlas became so heated and desperate that Ryan gave in to the use of pheromones to control the population, a direct violation of the very principles he claimed to live by. This is what led Atlas to use the player character, Jack, which sets in motion the events of the games. Eventually the player confronts Ryan, who has activated Rapture’s self-destruct mechanism. Jack is revealed to be Ryan’s son and has been controlled the entire time by the phrase, “Would You Kindly?” and is offered a golf club. With his final quote of “a man chooses, a slave obeys,” Ryan orders his son to kill him. By simply betraying his own principles, Ryan sets in motion the chain of events that leads to the destruction of his life’s work and his own violent death at the hands of his own illegitimate son. Rapture: it’s not just for the fundies any more! Galt never attempted to control anything about his utopia and never violated his principles, which led the Gulch to remain prosperous. The Gulch was so strong at the end of the book, it is implied that all of society was rebuilt in their vision. Galt remains a beloved leader who inspires his followers, and eventually shows the rest of the world how a free society can function. Ryan becomes a fanatical tyrant who uses the science he believed would save humanity to control the populace. He becomes that which he feared the most, and in doing so, doomed his utopia to its descent into madness and destruction. The only redeeming feature that Ryan keeps to his end is his spine of steel; even as he is dying, Ryan stands up for what he believes in. This is the only thing about Ryan that is admirable in the end. The determined, yet cynical visionary who created Rapture dies slowly, only to be replaced by with a nearly insane tyrant who throws away all of his principles, and ultimately his life’s work. Are you a man or a slave? These characters are written with two different opinions on libertarianism. Rand wrote Galt in defense of Objectivism, while Levine shares his vision of how a truly libertarian society would fail. Many writers have used Bioshock as an example that any libertarian society would turn to ruin by the very beliefs that create it. I challenge this concept. Rapture was a utopia until a deus ex machina like ADAM appeared. Had this substance never been discovered, Rapture would have continued its path of improvment. Was Ken Levine showing respect to libertarian philosophy? The game needed to take place in a dystopian society, so a substance that couldn’t exist in reality had to be created just to make Rapture go to hell. With that knowledge, I can turn the tale of Bioshock into one defending the market; a free market society works until an outside power forces change, that which will always result in ruin. Is this what the writers had in mind? As for Ayn Rand, I’ve made no attempt to hide my disdain for Atlas Shrugged, though I recommend reading some of her nonfiction. A good start is Capitalism: The Unknown Ideal, which lays out the beliefs of Objectivism without the overbearing preachiness that is Galt’s diatribe at the end of Atlas Shrugged. If you must read Rand’s fiction, my only recommendation is the excellent Anthem. I will state that though I did enjoy the book, the unofficial musical adaptation was far better. The greatest concept album of all time. If you’ve never listened to it, you are depriving yourself. I hope you enjoyed this entry of Free to Play. As always, thanks for reading. Great arcticle, Derik! I like how you make concepts very easy to understand. I have not played through Bioshock or read Atlas Shrugged, but another inconsistency that stands out to me is that Andrew Ryan used his shell companies so that others would create the technology necessary to make the Rapture exist. It seems a bit hypocritical to call those in power “parasites” and then benefit from others’ work. A bit of googling shows that John Galt was actually working for a company as he developed the technology for Galt’s Gulch, and any other technology he acquired was from willing recruits. Also, Anthem is an under-recommended piece of political/philosophical-fiction! Thanks, Aaron. Sorry about applying late. Tue way I see that Ryan escapes being a parsite is that he pays others for their work. Galt actually leaves his best invention at his old job, the static electric motor. Ah, gotcha. And he probably wasn’t making money off of them either, unlike the people Galt worked for.